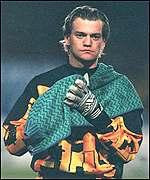 Representative Honours: Northern Ireland: Full Caps (1997-date), 11 Under-21 Caps (1998-1999). Club Honours: (with Wigan) Football League Trophy Winner 1998/99; (with Man. United) FA Premier League Champion 2002/03; FA Cup Winner 2003/04, Runner-Up 2004/05; (with Olympiacos) Greek Super League Champion 2012/13; Greek Cup Winner 2011/12, 2012/13; (with Linfield) NIFL Champion 2016/17; Irish Cup Winner 2016/17; Co Antrim Shield Winner 2016/17 (unused sub). Awards: PFA Division Two Team of the Year 2000; The Golden Cage (Danish Goalkeeper of the Year) 2009; Northern Ireland International Personality of the Year 2013; NIFWA Goalkeeper of the Year 2017. 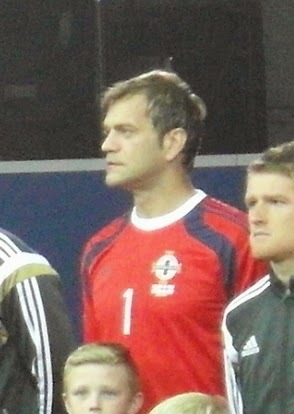 Roy Carroll agreed his release from Odense in January 2011 in an attempt to secure a move back to the UK. After several trials over a six month period he joined Greek Super League side, OFI Crete. His performances for Crete earned him a mid-season move to Greek giants, Olympiacos. He made his début in dramatic circumstances, coming off the bench to save a penalty in a 1-0 win Europa League win over Rubin Kazan. After a near-six year absence from the international scene, Carroll was recalled by Michael O'Neill.